Many words are used to describe dizziness. These include disorientation, imbalance, light-headedness and swaying, but true vertigo is characterized by a spinning sensation. Vertigo can be accompanied by nausea, vomiting and sweating. For some sufferers, dizziness can last only a few short seconds while others may experience dizziness for much longer periods. Imbalance symptoms can afflict all age groups, but it is most common in older people. The vestibular system or labyrinth – the balance system – helps us maintain the orientation of our bodies in space and helps us keep our posture and sense of balance. It helps us regulate our movements and focus visually while our bodies are in motion. The balance system uses sensory information from the vestibular organs (balance organs in the inner ear), the visual system and the somatosensory or proprioceptive systems. Sensory nerves associated with our eyes, muscles and joints send their signals to the spinal cord and brain. All these parts work together to help us keep our balance. The inner ear contains three semicircular canals that are responsible for gathering information about the position and movement of the head and body. Inside the canals is a fluid called endolymph. When you move your head, the endolymph moves, causing information to be sent to the brain about the body’s position. Disorders that cause dizziness are categorized as peripheral (coming from the semicircular canals), central (coming from the brain or related pathways) or systemic (resulting from problems in the nerves or organs outside of the head, such as anemia, high blood pressure, diabetes, arthritis or cataracts and other eye problems. Classic symptoms of Meniere’s Disease include severe bouts of vertigo, tinnitus (usually described as “roaring”), fluctuating hearing loss and aural fullness (a feeling of pressure in the ears). Meniere’s Disease affects one ear but can occur in both ears. It is common to see the hearing loss start in the low pitches and gradually worsen to affect all of the frequencies tested during a routine audiogram. Hearing loss often fluctuates but eventually deteriorates to some degree of permanent hearing loss. The symptoms of Meniere’s are caused by changes in the volume of endolymph. It is thought to happen is that an over-abundance of endolymph “backs up” into the semicircular canals causing the canals to swell resulting in dysfunction. Individuals with BPPV experience dizziness and sometimes nausea after positional changes (i.e. rolling over, getting out of bed or tipping the head back). BPPV is due to small crystals consisting of calcium carbonate, normally present within the inner ear, becoming displaced. The displaced crystals are usually due to head injury, infection or disorders of the inner ear. The most common cause of BPPV in the elderly population is degeneration of the vestibular system, while in the younger population it is commonly caused by trauma to the head. Symptoms are often intermittent and may cease for a period but may recur some time later. Medications such as Meclizine and Antivert will not cure the condition, but may provide temporary relief. The best treatment for this type of dizziness involves physical maneuvers and exercises that reposition the crystals back to their usual location. A cervical collar (soft neck brace) is generally worn for 48 hours after maneuvers are performed. These repositioning maneuvers are performed by a specially trained medical professional. Usually, involves severe dizziness but is not accompanied by hearing loss. The dizziness from vestibular neuronitis is thought to result from a viral infection of the vestibular nerve which caused it to be inflamed and/or irritated. An Acoustic Neuroma is a benign (non-cancerous), slow-growing tumor that develops along the hearing nerve and sometimes the vestibular nerve. The most common sign of an acoustic neuroma is hearing loss. However, dizziness can result when pressure on the nerve causes conflicting signals to be sent to the brain regarding the body’s position and movement. To determine the cause of your dizziness you first need a complete medical examination by your physician or otologist (ENT physician). Vision, blood pressure, heart rhythm and gait are typically assessed during your evaluation. 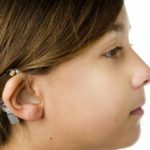 An audiologic (diagnostic hearing) evaluation is often recommended as it provides valuable information to the physician about the functioning of your auditory system. Sometimes a referral to a neurologist is made. • Auditory Brainstem Response (ABR): Electrodes are placed on the forehead and in the ear canals. A clicking sound is then delivered to each ear. Electrical activity in the hearing nerve and brain stem is measured. This test primarily determines how well sound travels from your hearing nerve to the brainstem, and a comparison is made between the ears. • Videonystagmography (VNG): This test measures and records your eye movements as you perform a series of visual tasks and as you move into different body positions. During the final portion of the test, small amounts of both cold and warm water will be put in your ears. The test assists in pinpointing the source of the problem. • Electrocochleography (ECoG): Electrodes are placed on the forehead and in the ears. A clicking sound is delivered to each ear and changes in the electrical activity of the inner ear are measured and recorded.